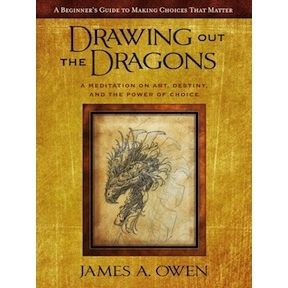 Presenting a special offer from James A. Owen and the Awesomist Revolution: you can download a PDF of the book Drawing Out The Dragons: A Meditation on Art, Destiny, and the Power Of Choice for free during the first 10 days of September. Then in October, all three Meditation books (Drawing Out The Dragons, The Barbizon Diaries, and The Grand Design) will go on sale in all ebook formats from all online distributors. Please pass this link along to friends and family any anyone else who might need a boost of inspiration and moxie. Then start reading, and make the choice: how extraordinary do you want your life to be? UPDATE: the offer has been extended through the rest of the month of September, and perhaps after that as well. Some stories are too important not to share, and I want everyone who comes to this link to be able to download and read the book.